Please join Jennifer Bryant Pedersen, soprano and Cathy Adkins, piano on October 1 at 2:00 p.m. in the Sanctuary! This free program features the beautiful melodies of Schubert, Debussy, Mozart, Verdi and Barber and centers around the ever-changing expressions of the heart and mind. 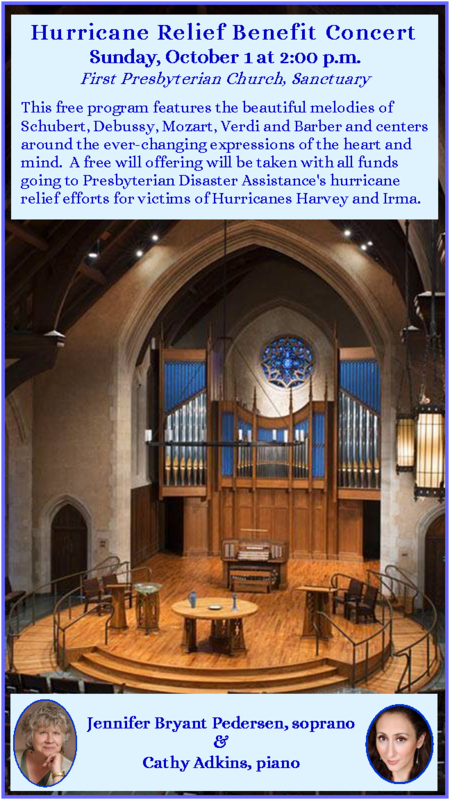 A free will offering will be taken with all funds going to Presbyterian Disaster Assistance's hurricane relief efforts for victims of Hurricanes Harvey and Irma.